According to Clay Risen, we tend to credit the achievement of the Civil Rights Act to Lyndon B. Johnson and Martin Luther King, Jr. largely because theirs are the names and stories with which we are familiar. Risen is kind enough to include himself in the “we” but I suspect he doesn’t actually belong there. I, however, do. In a word association game, I would complete “Emancipation Proclamation” with “Abraham Lincoln” and the “The New Deal” with “FDR,” because those are the only names I know. If there were more in my high school A.P. history study guide, I don’t remember them. 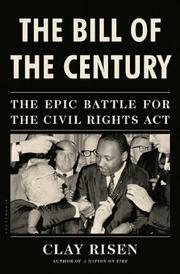 In The Bill of the Century: The Epic Battle for the Civil Rights Act, Risen sets out to correct that distortion by presenting us with the literary equivalent to a “making of,” documentary, beginning in early 1963, a point during John F. Kennedy’s term at which civil rights legislation was at low ebb, and tracing the gradual rise of tide leading to the signing of the Civil Rights Bill on July 2, 1964. A work that sets out to reframe historical events can’t help but shine a light on the fact that any view of history is a result of framing. Maybe this is why I found myself drawn to the moments in the book that revealed how players strove to frame events even as they were happening. While some examples of this—like a gala White House reception where Langston Hughes and Sammy Davis Junior rub elbows with Democrats for the cameras in a ploy to distract from John F. Kennedy’s meager progress on civil rights—felt par for the political course, other instances gave me pause. If it sounds complex and confusing, it is. Risen, an accomplished journalist and author of A Nation on Fire, America in the Wake of the King Assassination, admirably manages to introduce and contextualize dozens of individuals—senators, congressmen, and myriad civilian activists—as well as organizations and political factions, but the density of information he is delivering can make for strenuous reading. I’ve no doubt been spoiled by textbooks and George R.R. Martin novels, but by page 150 I would have been grateful for a fold-out timeline, a tree graph showing all the characters and their affiliations, and maybe a cheat-sheet with acronyms and their translations. Despite this, I recommend The Bill of the Century. “The story of the civil rights bill,” says Risen “is about the interplay between elected officials, government officials, lobbyists, and countless thousands of activists around the country, pushing and pulling each other toward their common goal.” That story, with all its details, dramas and complexities, is what Risen delivers. Posted on March 9, 2014 March 9, 2014 by barrington99Posted in Books, UncategorizedTagged Civil Rights Act, Civil Rights Bill, civil rights legislation, George Wallace, Jr., Martin Luther King, Martin Luther King Junior. Next Next post: Read Scripts. Watch Movies. Write Pages. HA! Good enough review for me to buy the book for my Dad’s birthday! Cool! I just got someone a sale! Let me know if he likes it!